Tan Hung Phat Global Co., Ltd.
Can cut carbon steel and other metal materials. The main configuration option specified by the user, the user can specify their own choice what kind of configuration. CNC flame cutting machine welding machine as the gantry structure, internal stress by the elimination of processing, accuracy and stability. High precision rack and pinion drive, reliable and accurate positioning. I produced the CNC cutting machine has high, medium and low-grade three. HCG Series components include cutting machine CNC system, drive system, mechanical systems, pneumatic systems. 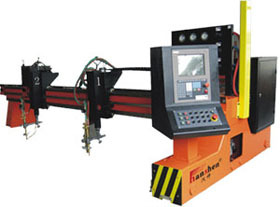 The machine is mainly used for various shapes of sheet metal plane Flame cutting, functional and high degree of automation, advanced configuration, cutting, high precision, good quality and dynamic stability of the strong. CNC system, servo system, the use of international or domestic brands, performance products, convenient user interface, friendly operation, rich software and high-quality hardware configuration, a full range of protective measures to provide users with a high-quality products . ● Application: widely used in boilers, pressure vessels, machinery, steel, shipbuilding and other industries. Copyright © 2019 thpvn.com. All Rights Reserved.